Editor’s note: The original article was updated to include information on the Hybrid and ST versions of the 2020 Explorer. The original Ford Explorer is the reason most American families want to drive an SUV. It debuted for 1991, offering more interior room than typical SUVs of that time, as well as a more rugged appearance than a station wagon or a minivan. 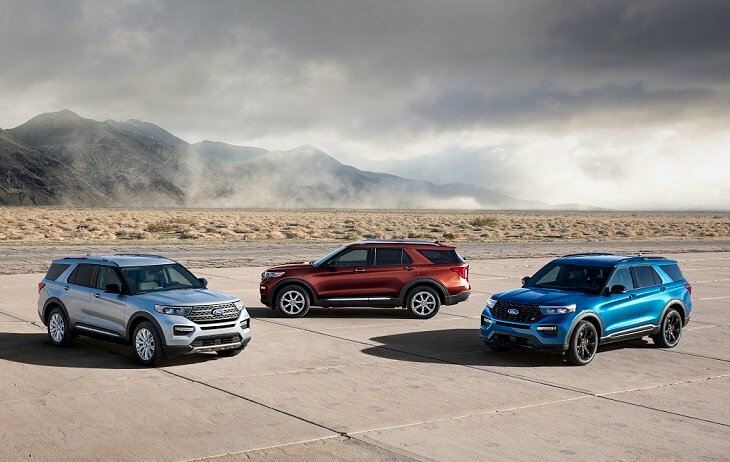 Since that time, the Explorer has been one of the best-selling models in the United States, and the redesigned 2020 Explorer is likely to ensure that the nameplate remains popular for years to come. Offered in base, XLT, Limited, Hybrid, ST, and Platinum trim, the new Explorer is built in Chicago. If you think the new Explorer looks like the old Explorer, you’re right. The design cues are similar, but the proportions are different thanks to the new vehicle architecture. Standard equipment includes 18-in. aluminum wheels and a power rear liftgate. Windshield and rear roof pillars are blacked out, and the middle roof pillar is body color, similar to the outgoing Explorer. Performance-tuned ST trim looks appropriately aggressive, while Platinum trim adds upscale design cues to signal its elevated position within the lineup. A set of 20-in. wheels is optional and, for ST and Platinum trim, 21-in. wheels are available. Ford says the new Explorer holds up to seven people and provides lots of storage space. Hip room in the front and second-row seats is class-leading, according to the automaker, and headroom in the second- and third-row seats cannot be beat. Standard dual-zone automatic climate control helps to keep front-seat occupants comfortable, and second-row seats slide to help provide the right mix of comfort for folks in the back. New LATCH anchors allow installation of a child safety seat in any seating location, and retractable side window shades are available for the second-row seat. Power-folding third-row seats are available, creating a larger, flatter cargo area than many key competitors, according to Ford. Cargo volume measurements are 18.2 cu. ft. behind the third row, 47.9 cu. ft. behind the second row, and 87.8 cu. ft. behind the front seats. Platinum trim adds luxury to the 2020 Explorer, including standard premium leather seats, leather applied to various parts of the cabin, and a dual-panel sunroof. The redesigned 2020 Explorer’s new rear-drive architecture is shared with the Lincoln Aviator, and is lighter and stronger than before. 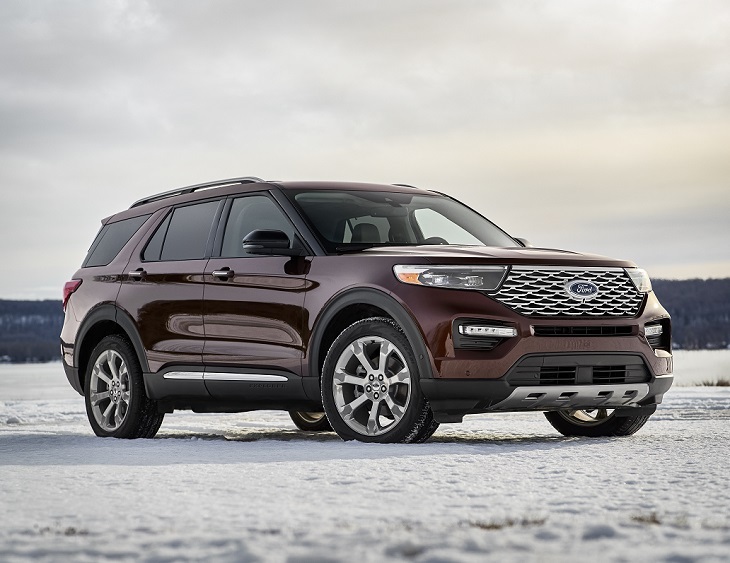 An available Intelligent 4-Wheel-Drive (AWD) system with a Terrain Management system gives the new Explorer what Ford says is improved off-roading capability. Seven different driving modes are available with Terrain Management: Normal, Sport, Eco, Slippery, Trail, Deep Snow/Sand, and Tow/Haul. Minimum ground clearance measures 7.9 ins. with RWD and 8.2 ins. with AWD. 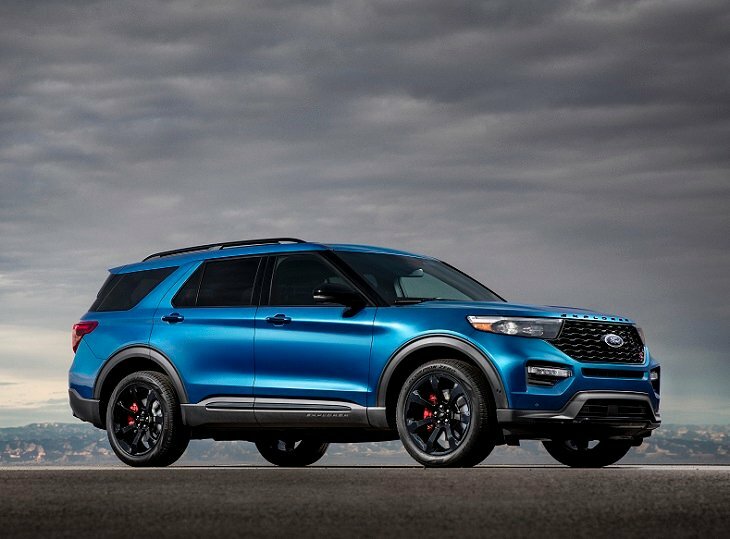 Ford uses its family of turbocharged EcoBoost engines in the new Explorer, with a plug-in hybrid version expected to add efficiency and plenty of power. A turbocharged, 2.3-liter 4-cylinder engine is standard for base, XLT, and Limited trim. It makes an estimated 300 horsepower and 310 lb.-ft. of torque, and with the optional towing package can tug a 5,300-lb. load. Automatic engine start/stop aims to improve this engine’s efficiency. A twin-turbocharged, 3.0-liter V-6 engine is standard in Explorer Platinum and supplies 5,600 lbs. of maximum towing capacity. It is expected to make 365 horsepower and 380 lb.-ft. operating on 93-octane fuel. The Explorer ST has a more powerful version of the twin-turbo V-6, massaged to make 400 horsepower and 415 lb.-ft. of torque. Standard equipment includes AWD, stiffer suspension, and upgraded brakes. ST Street Pack and ST Track Pack options further improve performance. 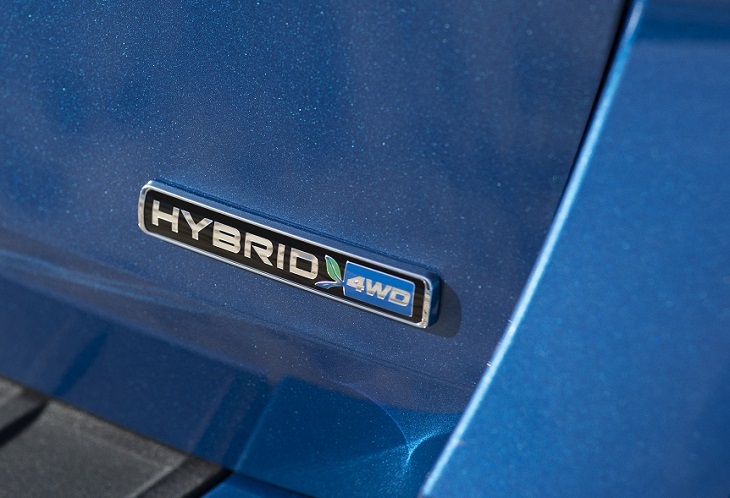 Ford’s new Explorer Hybrid is based on a 3.3-liter V-6 engine, and total system output measures 318 horsepower. Ford says that the rear-drive version will travel 500 miles on a single tank of gas. Every one of the Explorer’s engines is paired with a new 10-speed automatic transmission. Every 2020 Ford Explorer includes a reversing camera with a built-in lens washer, hill-start assist, and post-collision braking. Post-collision braking is designed to bring the SUV to a stop as soon as is possible following an initial collision in order to reduce the possibility that secondary collisions will harm the Explorer’s occupants. Ford’s Co-Pilot360 safety suite is also standard and equips the 2020 Explorer with blind-spot monitoring, rear cross-traffic alert, lane-keeping assist, collision warning with pedestrian detection and dynamic brake support, automatic emergency braking, and automatic headlights with automatic high-beam operation. With XLT trim, the blind-spot monitoring system adds trailer tow coverage. An available Ford Co-Pilot360 Assist+ package is optional on the XLT and standard on Limited, Hybrid, ST, and Platinum trims. It includes adaptive cruise control with stop-and-go and lane-centering assist, speed sign recognition, and evasive-steering assist. It also equips the SUV with a navigation system and SiriusXM Traffic and Travel Link services. Limited, Hybrid, and ST trim also adds rain-sensing wipers and a 360-degree surround-view camera system, while Platinum trim features reverse automatic braking and a new Active Park Assist 2.0 system that can park the Explorer in a parallel or perpendicular parking space without any driver assistance with the steering, brake, accelerator, or transmission. Ford equips every 2020 Explorer with an updated Sync 3 infotainment system with an 8-in. 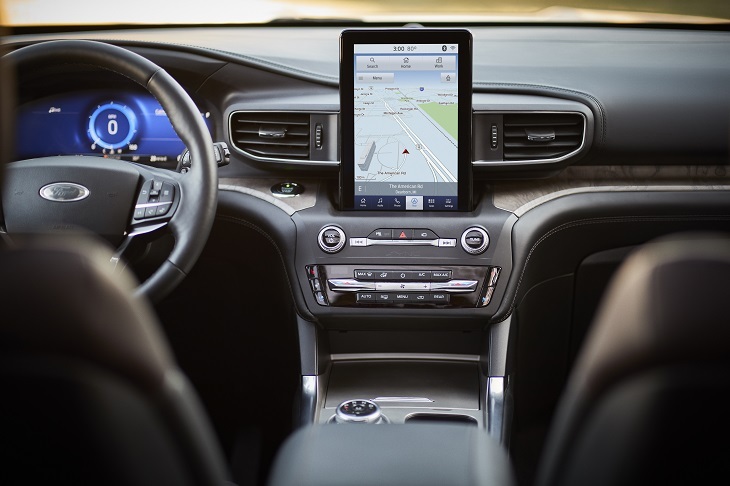 capacitive-touch display screen, Apple CarPlay, Android Auto, satellite radio, USB-C charging ports, and FordPass Connect with a 4G LTE Wi-Fi hotspot for up to 10 paired devices. FordPass Connect also provides remote access to certain vehicle features via smartphone app. Limited, Hybrid, ST, and Platinum trim equip the Explorer with HD Radio. As an option, a 10.1-in. vertically oriented display with navigation and Waze integration is available. Additional upgrades include a wireless device charging pad and a 14-speaker B&O Play premium sound system. Ford also offers a 12.3-in. digital instrumentation display that changes its displayed information and appearance depending on the selected driving mode.